A paddle is an implement for manually moving and guiding a small boat. A paddle consists of a shaft with a broad flat surface, called a blade, on one or both ends. The area where the blade joins or tapers into the shaft is called the throat. Paddles differ from oars in that they are used without oar locks, the attachments that clamp the oars to a boat. Paddles are used to propel and steer a canoe or kayak by pulling or pushing the paddle blade against the water along the sides of the boat. For forward motion the paddler puts the blade in the water and pulls the shaft to the rear, first along one side and then along the other. Controlling direction and steering the boat are accomplished either by repeatedly or strongly paddling on one side of the boat or by altering the fundamental linear stroke pattern. Paddle shafts can vary in shape and diameter. Round cross sections of 1-1.25 inches (2.5-3.2 cm) in diameter are typical, but elliptical shapes are also used. Some designs taper from fully round at the shaft's mid-point to elliptical at the throat. Other shafts are elliptical over their entire length. Shaft designs can include a bend near the paddle throat to increase the power of each stroke. Materials to protect and cushion the paddler's hands typically cover part of the shaft. Paddle blades vary in size and shape depending on their intended use and the strength of the paddler. A typical paddle blade is 8 inches (20 cm) wide and 18 inches (46 cm) long from its throat to the tip. Optimal blade size depends on the shoulder power of the individual paddler. Round blades called "pizza type" blades provide an example. Pizza blades are 12-14 inches (30-36 cm) wide and the same distance from throat to tip. They are used for racing and require a strong paddler to be most efficient because their larger area pushes more water with each stroke. Proper blade size is also important to recreational paddlers because a blade that is too small will cause a strong paddler to waste energy and cause unnecessary fatigue. The shape of the blade also affects a paddler's performance. The side of the blade used to push the water is called the power side. The power side of some blades are spoon shaped to scoop the water. This increases the resistance as the paddle moves through the water, and thereby increases the effect of the paddler's stroke. Paddles can be single or double bladed. Single-bladed paddles have a blade at one end of the shaft and a grip at the other end. Grips can be T-shaped, flared to form a triangular shape, or have a simple rounded end. Canoe paddlers use a single-bladed paddle that is typically about 4-5 feet (1.2-1.5 m) long. They switch their grasp on the paddle's throat and grip from one hand to the other as they alternate strokes on the left and right sides of the canoe. In contrast kayakers use a double-bladed paddle about 7-9 feet (2-2.7 m) long. This enables kayakers to alternate left and right strokes without needing to change their grasp on the paddle. Double-bladed paddles typically have a grip area at the mid point of the shaft. They can also have elliptically shaped shafts with blades set at right angles to each other. This design is said to have feathered blades. Feather-bladed paddles offer an advantage over traditionally oriented blades in that the angle between the feathered blades allows the paddler to pull one blade through the water while the other blade slices horizontally through the air. This reduces air resistance on the blade out of the water and increases the paddler's efficiency. The elliptical shape of the shaft lets the paddler know the orientation of the blades. Ancient paddles were made primarily of wood, and most specimens have disintegrated. However some ancient paddles have been found with features such as ivory fittings on the blade tips to prevent splitting and damage. Native Americans introduced paddling to fur traders as a faster mode of propulsion than using long, non-bladed poles to push their boats through the water by planting the pole into the river bed. Native peoples of the Arctic regions and Greenland used both single-bladed and double-bladed paddles. Primitive single-bladed paddles were about 63 inches (160 cm) long with a blade about 5 inches (13 cm) wide. These paddles were used for larger and deeper boats where the use of double-bladed paddles would be difficult. Single-bladed paddles were particularly useful when sneaking close to sea mammals, which would dive upon hearing the slightest noise. Hunters held the paddle in the hand away from the game, allowing the hunter to hold his weapon in the hand closest to the game. Double-bladed paddles used in narrower, smaller boats had very narrow blades usually of about 3 inches (7.6 cm) wide and much longer shafts, usually about 94 inches (239 cm) long. The blades were typically positioned on the shaft in the same plane. Some of these primitive double-bladed paddles had convex blades. Today many people consider wooden paddles to be the most aesthetically pleasing. Wooden paddles are relatively lightweight, about 2.5-3.5 pounds (1.1-1.6 kg). Shafts can be custom made from 1.25-inch (3.2 cm) diameter pole or by piecing together separate halves of a softwood outer layer with a hardwood center. The separate halves are fastened in the middle with a scarf joint, a joining technique that notches two pieces so that they overlap into one continuous piece. The hardwood center extends into the blade as a reinforcement and also to provide a means of securely attaching the blade to the shaft. The wooden blades are constructed by layering and bonding thin wood pieces together with glue or resin. The blades can be faced with more attractive wood veneers. Caps of metal or fiberglass fit on the tip of the blade for protection against abrasion. Wooden paddles can also be finished with fiberglass and epoxy resin for improved durability. Paddles are made from a variety of materials. Wood, fiberglass, aluminum, and plastic can be used alone or in combination with other materials to make the entire paddle. 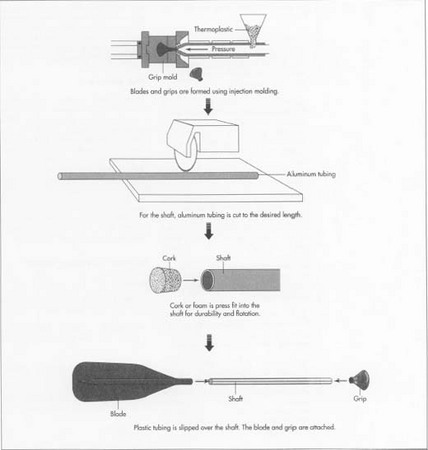 The manufacturing process described below is for a paddle with a combination of a cork-filled or foam-filled tempered aluminum shaft with plastic blades and grips. Hollow aluminum tubing of different thicknesses is used as the structural portion of the paddle's shaft. The tubing is purchased in long pieces from a source outside of the fabricator. Cork or foam materials are used to fill the hollow tubing to prevent water infiltration and to help the paddle float. These are also purchased from outside sources. Cork may be purchased in dowel form or as stoppers. Thermoplastic powder and color pigment are bought for making blades and grips at the fabricator's shop. Plastic tubing or other material will wrap around the shaft for comfort and protection of the paddler's hands from the bare aluminum, as well as for protection against corrosion. The following paddle manufacturing process is an assembly line operation. It can be used to manufacture several types of paddles. It combines custom-made pieces, alterations to stock materials, and assembly. machine into a heated barrel that mixes and softens them. The softened material is then forced, or injected, through the barrel by a retractable screw or plunger into a relatively cool mold cavity for hardening. In paddle manufacturing the mold cavity is shaped like the blade or grip. Once the blade or grip is fully cured, the detachable mold cavity is opened, thereby releasing the molded plastic piece. The injection molding process can operate continuously since the screw can retract to fill the barrel with fresh raw materials while the piece in the cavity hardens. 2 Blades and grips must be inspected for flash. Flash is excess plastic that seeped into the seams of the mold cavity and hardened. Blades and grips are cleaned by hand to remove the excess plastic and smooth the edges. 3 Aluminum tubing is cut to length using a table saw. The plastic tubing or other protective material used to cover the shaft is also cut by this method. 4 Once the shafts are cut to size, the cork or foam can be press fit into the shaft. A press fit is the name for a method of attaching pieces together using the tightness of the bond that results from forcing the two pieces together. Excess cork or foam is trimmed by hand. 5 The exact order of assembly can vary. In a typical operation plastic tubing or other protective material is slipped over the aluminum shaft. The plastic tubing is heated with a hot air gun, which causes it to shrink tightly onto the shaft. In some assembly operations the grip is pushed onto the aluminum shaft before the plastic tubing. In this case the plastic tubing shrinks over the neck of the grip, therefore securing the grip to the shaft as well. 6 The neck of the blade is press fit on to the plastic covered shaft at the paddle's throat. This helps prevent the blade from becoming loose and spinning on the shaft. 7 In another variation, the grips and blades are shaped so that they are pushed inside the ends of the plastic covered aluminum tubing by machine. Hydraulic or pneumatic presses squeeze and slightly deform the ends of the aluminum tubing into the neck of the blade or grip to securely fasten the plastic pieces. 8 Once the paddle is fully assembled, it is wrapped in a clear plastic bag. The paddles are then packed in corrugated boxes, about 30 to a box, for shipping to distributors. The primary byproducts of the process described above are scraps of aluminum from the cutting of the shafts and plastic scraps and shavings from forming the blades and grips. The plastic can be melted and reused in other injection molded products. The aluminum is recycled in a manner similar to the recycling of aluminum beverage cans. Recent research has led to lighter weight paddles made from various materials. For example Olympic kayak racer Greg Barton researched the design, construction, and testing of lightweight composite kayak paddles. His new paddles weigh less than half the weight of the best wooden paddle today. Other research at the University of California's Livermore Laboratories has developed instrumentation designed to instantaneously measure the power output and synchrony of rowers in team boats as well as physiological parameters such as heart rate. This instrumentation may lead to improvements in the design and manufacture of paddles. Gordon, I. Herbert. Canoeing Made Easy. The Globe Peguot Press, 1992. Johannaber, F. Injection Molding Machines, A User's Guide. Macmillan Publishing Co., 1979. Kulczycki, Chris. The Kayak Shop. McGraw Hill, 1993. Seidman, David. The Essential Sea Kayaker. International Marine Publishing, 1992. "Bent Shaft Canoe Paddle to Speed up Your Trip." Materials Engineering, November 1984, p. 41. Noble, Peter, Michael Wadden, Timothy Bourke, David Williams, and Knut Nordbo. "An Introduction to Ethnotechnology for Naval Architects: Sea Kayak Design of Yesterday and Tomorrow." Marine Technology, October 1994, pp. 305-14.